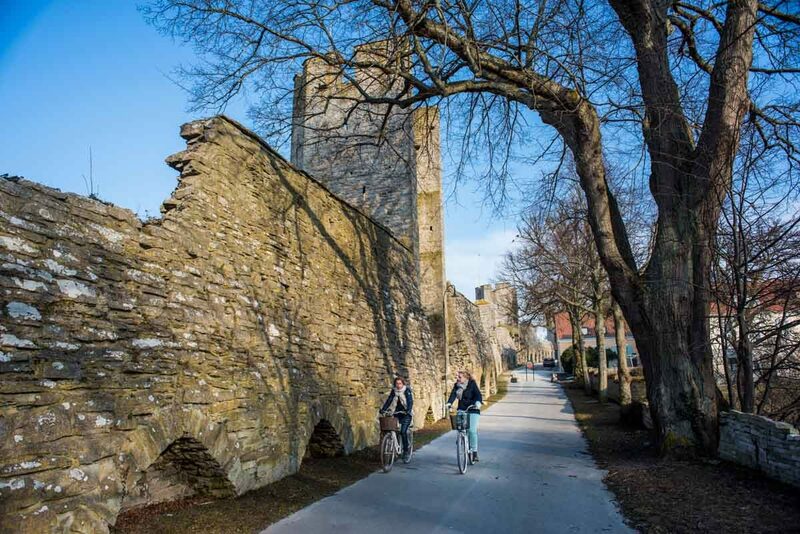 Bikers by the north wall of the city of Visby. As you know from reading this blog, we’re complete suckers for Unesco World Heritage sites, so it was a no-brainer to extend our visit to Sweden long enough to ferry from Stockholm to the island of Gotland to visit the beautiful medieval city of Visby. 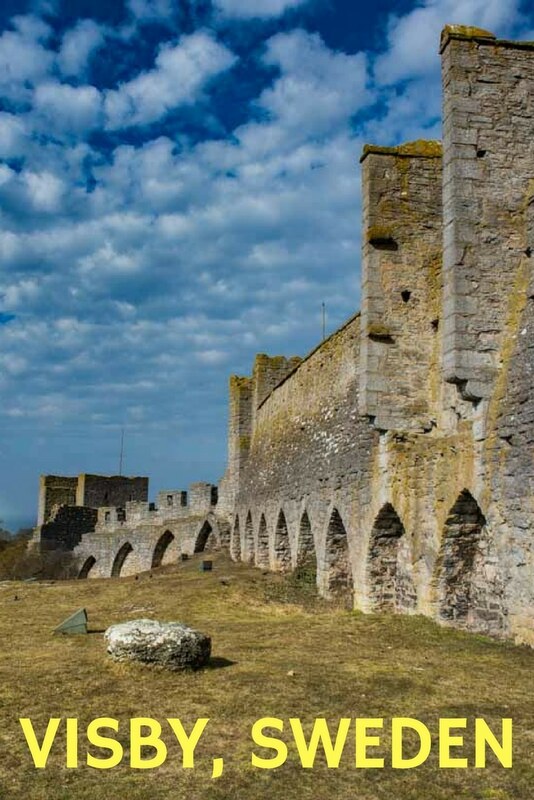 Visby sits on the western coast of the Gotland Island, which sits pretty much right in the middle of the Baltic Sea. As the Baltic Sea was the main trading route between medieval Sweden, Finland, Poland, Germany, Estonia, Latvia, Lithuania, Denmark, Norway and Russia, one can easily see its historical economic and military importance. And, if a place is economically and militarily important, there’s going to be conflict. And there was. Visby, to make a long story short, between the 11th and 15th Centuries bounced between independence and being the vassal of Swedish and Danish kings, with a few other ambitious rulers, including some pirates. If you’re interested in detail, you can read Wikipedia, like I did. The height of Visby’s prosperity was as a member of the Hanseatic League, a confederation of merchant cities in the north of Europe which, among their other dealings, had mutual defense agreements. The League was the dominant power in the area from about the 12th to 16th Centuries, and for the most part was able to defend its interests from the various princes who wished to dominate trade themselves. For a while, Visby was the capital of the Hanseatic League, and flourished as such. All this is the barest of backgrounds to explain Visby’s visible prosperity and unique set of ruins which dominate the city today. 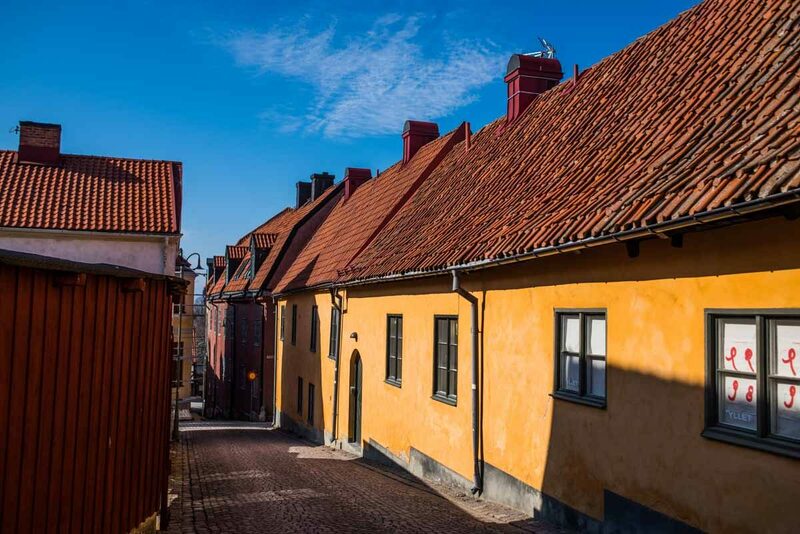 The typical street of Visby: bright walls, all streets in good repair, and an evident prosperity. As I mentioned above, the look of Visby is one of prosperity. As everywhere in Sweden, the homes and streets are well kept, the paint on the antique walls is fresh, and even the cobblestones seem to be polished. Although we were there in late spring, there were still some snow piles. But they were just that: small piles that were covered with a sand and small gravel grit. That same grit, which we saw in all the other Swedish cities we visited, sure seems to be a better alternative to the salt used in the United States (at least in Minnesota.) It provides damn good footing for walkers and drivers alike. Visby is full of shops and homes that border these well kept streets. Most buildings are no more than two stories tall, although there are a few of four or five stories that are left over from perhaps the 14th Century or so and feature that distinctive northern European architecture you usually see in Amsterdam. You can tell which ones are the really old ones because there is a model of the city as it was in the 13th Century in the Gotland Museum. The ruins of the church of St. Karin (Catherine) seen from the streets above the main square. Punctuating all these quaint lanes are the ruins of the Christian churches built in the early years of Visby’s prosperity. Some of the ruins are in better shape than others, and some of the larger and better preserved ones are open to crawl around in during the summer. Unfortunately, they weren’t open yet when we visited. But, you can see much of the extant columns and arches, especially of Saint Karin’s Cathedral on the main square, from the chained up gate. The ruins of the church of St. Karin (Catherine) on the main square of Visby. What is particularly interesting about the church ruins is how they came to be so. There were a couple of significant events. First, the Danish King Valdemar IV essentially looted all the churches in 1361 when he conquered the city. Second, and more effective though, was the Reformation. 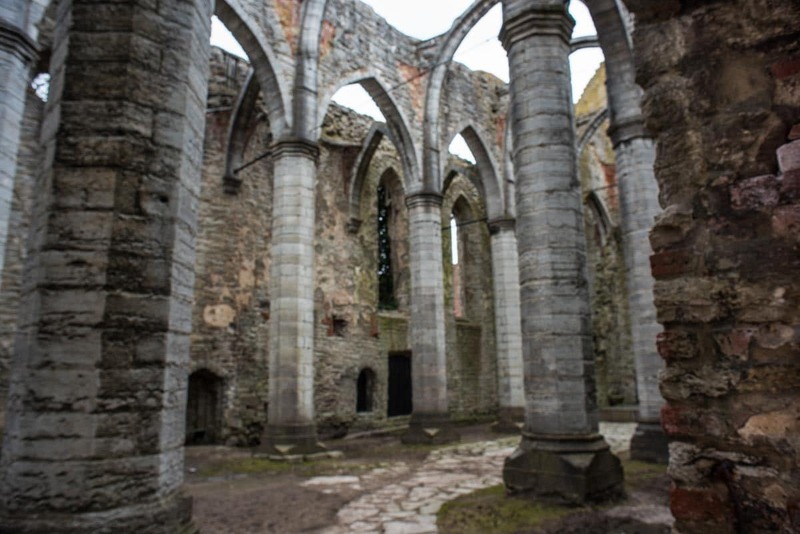 After the Reformation came to Visby, all the then Catholic churches lost their guaranteed source of income and were essentially abandoned and allowed to go derelict. Except for the current Cathedral of Visby, which was chosen as the cathedral of the new religion, the rest fell into ruin. There are twelve church ruins in Visby, including ten within the city walls. The city is small enough that if you walk around long enough, you’re bound to run into all of them. The east wall of Visby. There are more than 3.5 kilometers of walls surrounding the Unesco World Heritage city. Then there are the walls. At the same time Visby was building all those churches, it was also building protective walls, which had mixed results of effectiveness. As I mentioned, Visby changed hands several times–walls or no. But the walls nevertheless have been better maintained than the churches and you can walk around the entire city on either side of the walls for some lovely views. 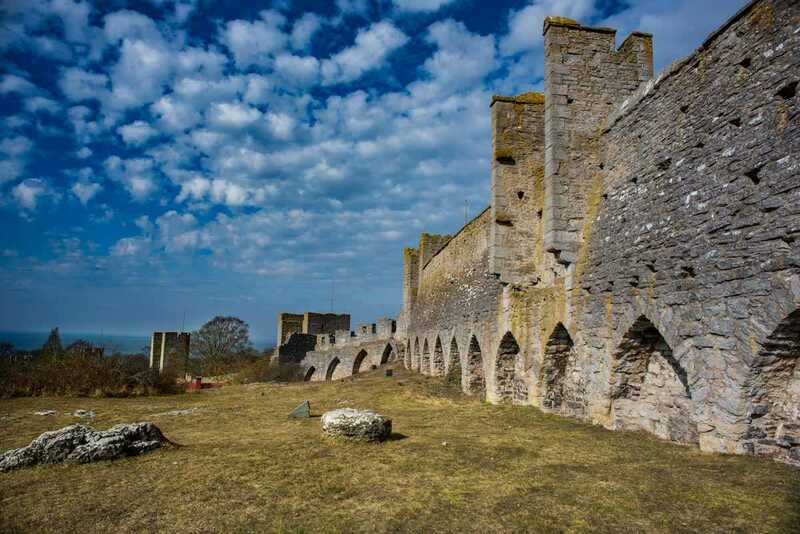 From the inside, there are a few places you can climb up to get a view of the Visby rooftops, including the remaining arches of some of the ruined churches. 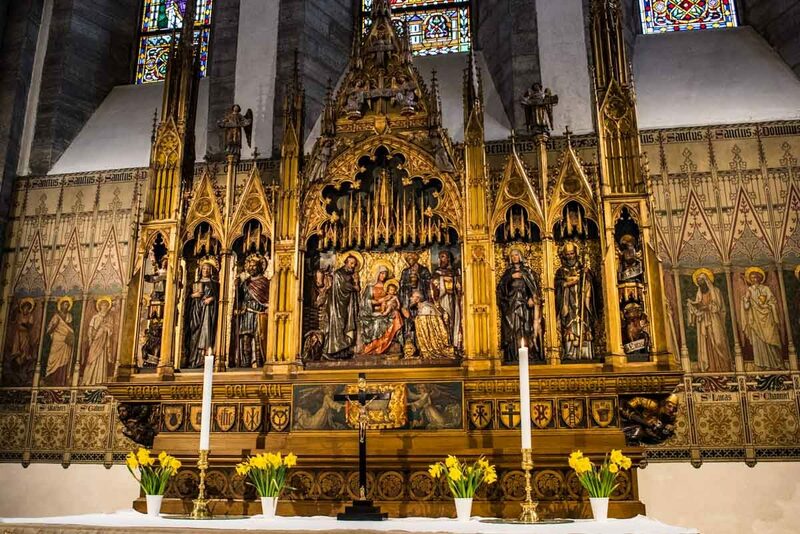 The altar at the Cathedral Domkyrka of Santa Maria. Not all the good church stuff was lost. Since we were there in the offseason, the attractions in Visby were slightly limited. Most of the festivals, music, etc. occur in the summer. But there were two museums that are definitely worth a visit. 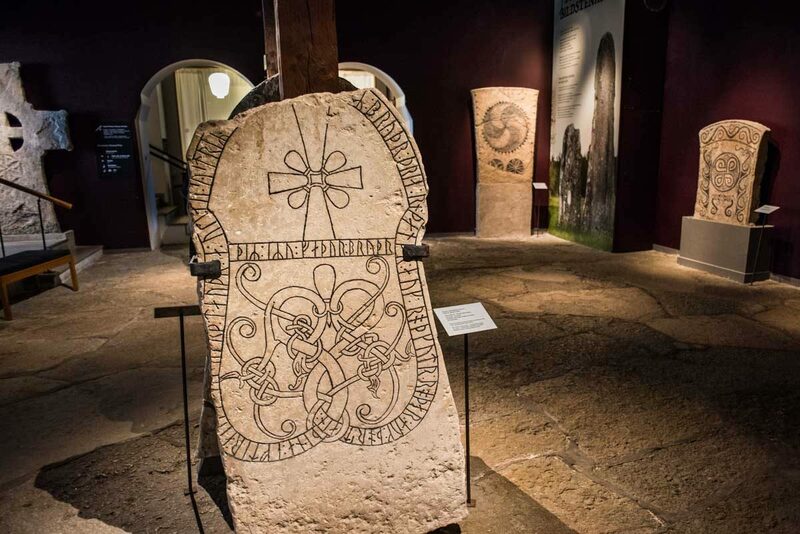 Runestones at the Gotland Museum. The Gotland Museum is a surprisingly good exhibit of the history of Visby and Gotland. There’s a history path, which will lead you through displays that give you a good idea of the history of Gotland, including the various shifts of power from the competing kingdoms. Included are plenty of archeology finds such as weapons, household goods, Viking treasure hordes, and tools dating back to the stone age. And, of course, rune stones. This is a small museum of three floors. When we visited, the first two floors were occupied by the works of contemporary Swedish artists. My favorite bit of the museum, though was a small room on the third floor which featured paintings by Visby artists from the 19th Century. Visby was a favorite destination of accomplished European artists at that time and there are many lovely plein air works of an impressionist bent in that room. 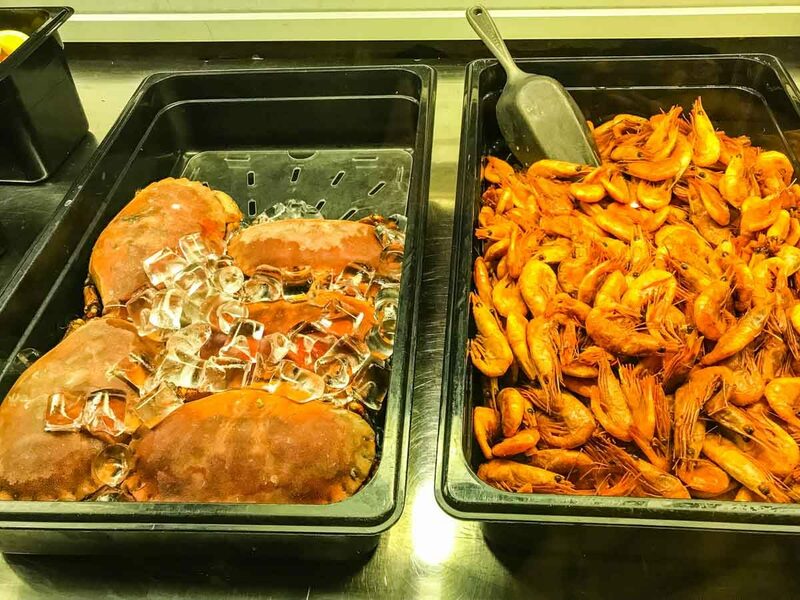 The very fresh crab and shrimp at Bakfickan restaurant in Visby. We visited many restaurants in Visby, and they were unerringly interesting and very tasty. Here they are in no particular order. We sort of went into Brooklyn Burgers by accident because they were open and we were hungry. As the name suggests, American style burgers with plenty of variations. I highly recommend the french fries, especially the ones that come with the jalapeño topping. Yum. We were sent to O’Leary’s to watch Champions League soccer matches. It’s an American style sports bar with plenty of televisions. Good Caesar salad. Not exactly Swedish, but gets the job done when your aim is to watch soccer. Ka:feit is a little coffee shop and lunch place that definitely fills in the nooks and crannies between the big meals. Salad bowls such as a big pile of fresh veggies and quinoa are the highlight. And, because to really understand Sweden, you have to understand fika–the almost mandatory coffee and sweet roll that Swedes have mid morning–Ka:feit had the most delicious cardamom roll you’ve ever tasted. Mille Lire Pizzeria is a little bit of Trastevere transplanted to Sweden. A wood-burning oven turns out a variety of genuine Italian pizzas. Creperie & Logi has two locations in Sweden. The other is in Åre, and we’ve now visited them both. The theme is Breton-style buckwheat crepes, which we were introduced to when we did a bike tour of Brittany last year. They’re stuffed with the usual savory fillings such as cured meats and cheeses. Add some greens, such as arugula, and an egg, and you have a very tasty lunch. Bakfickan was the most typically Swedish places we ate in Visby. A delicious smoked herring salad with sour cream for me; a half grilled crab for Kris. Absolutely delicious and the real highlight of Visby cuisine. You have your choice of many hotels in Visby. It is, after all, a bustling tourist attraction in the summer. We chose the Hotell Slottsbacken, for the reasons we usually choose a hotel: reasonable price, close to the station–in this case, the harbor–and central location for the areas we want to explore. Since Visby is so small, location is less important here. But Slottsbacken was a good choice. A nice breakfast, a helpful hotel staff who directed us to the good restaurants and places to see, and a comfortable room. And, like I said, because Visby is small, an easy walk to almost everywhere. For a list of hotels in Visby, click here to go to Booking.com. If you use this link to book a hotel in Visby, Travel Past 50 will receive a small commission at no additional cost to you. You can fly to Visby in about half an hour from Stockholm. But we prefer to take a ferry. From Stockholm, go to the central train/bus station and look for the signs for Destination Gotland. There you can buy a combination bus/ferry ticket to Nynäshamn, where you will catch the ferry. The bus is about 45 minutes and the ferry is about another three hours. Or, you can do it online via the Destination Gotland site. We found the website a little clunky and somehow ended up getting the ferry tickets but not the bus tickets. But, if you’re in central Stockholm, it’s just as easy to visit the station and take care of everything there. 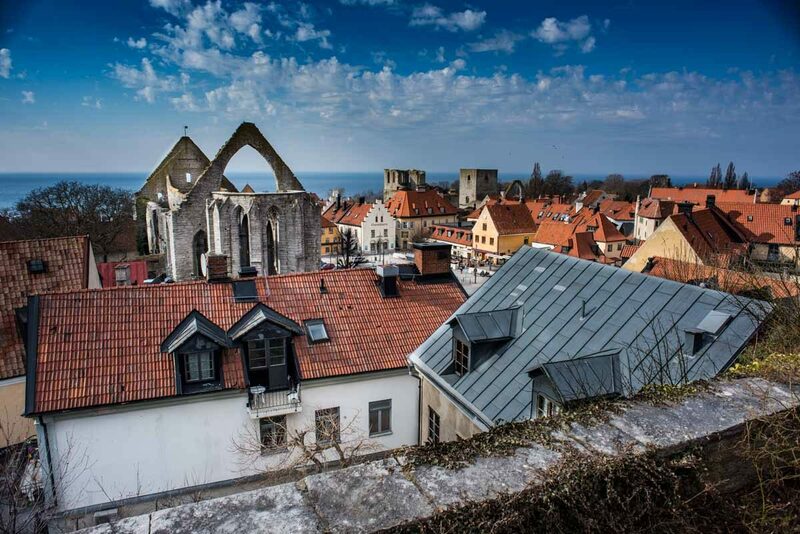 As mentioned above, the old city of Visby is a Unesco World Heritage Site in Sweden. Click the link to see all the world heritage sites in Sweden, with links to our coverage of the ones we’ve visited. Pin it, or use any of the share buttons below!